Suzuki Kiitsu was a student of the Edo-based Rinpa painter Sakai Hōitsu (1761–1828), the individual responsible for elevating and repositioning Ogata Kōrin (1658–1716) as an important figure in Japanese art history. Unlike Kōrin, however, neither Hōitsu nor Kiitsu were interested in embedding classical references into their work; rather, they were primarily concerned with exploring the designs and decorative aspects of Rinpa painting. 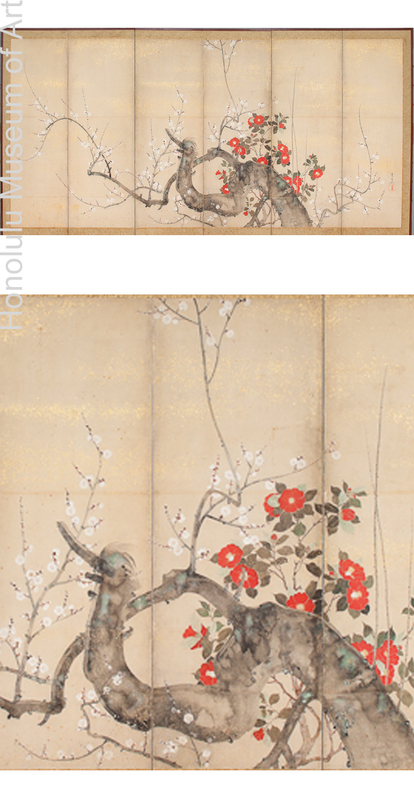 Flowering Plum and Camellia is a whimsical painting illustrating a typical Rinpa subject, that of blossoming flowers. The branches of the plum are rendered with abrupt curves and turns in an almost chaotic manner. Kiitsu has managed to balance the white and red blossoms in the painting by incorporating a dense arrangement of camellia that compensates for the weight of the expansive plum that stretches out over the composition. Another design element associated with Rinpa and that Kiitsu incorporates into his painting is the repetition of forms. The abrupt bending shape of the thicker branch, located closer to the foreground, is echoed by a thinner branch extending toward the left of the painting. The artist includes various geometric shapes and forms that are created through the use of empty space. The plum branches, for example, form a circular frame around a single camellia flower, Kiitsu also puts emphasis on the angular placement of branches to create squares and triangles. There is a strong focus on rhythm and curvilinear forms in the way in which the gently curving plum branches and stems weave through the composition. The surface of the paper is layered with an ink wash and scattered with kinpun (scattered particles of gold leaf) in order to bring harmony and balance to the composition, as well as to add decorative flair. Tarashikomi is used to render the lichen on the trunk and branches of the plum tree. Gold-based pigment is applied on top of certain areas of the plum’s branches to mimic the appearance of flying white, the calligraphic technique in which a brush stroke is intentionally applied in an uneven manner, leaving streaks of the underlying color visible within the stroke. This technique gives the impression of the brush leaping off the surface in a single stroke. All these techniques are frequently exploited in the Rinpa tradition.